My earlier post about the uses and abuses of PowerPoint generated a number of comments and emails. There are lots of strong opinions about PowerPoint, mostly negative and cautionary. I had remembered that Richard Whisnant did a session a few years ago on “PowerPoint and the Demise of Western Civilization.” I forgot that he started it off with a joke from a defense department contractor: “the way to win the war in Iraq is to drop copies of PowerPoint on Al Qaeda.” Now there is growing concern that the military’s reliance on PowerPoint is leading to poorly informed decisions that will undermine our strategy. We might have been better off just dropping the software on unsuspecting terrorists. Richard had a nice handout, which you can find here. I also heard from Willow Jacobson about a segment on The Daily Show that focused on the crazy PowerPoint from The New York Times illustrating our military strategy in Afghanistan. As usual, John Stewart is hilarious in pointing out the absurdities in using PowerPoint to set our strategy and direct our troops. I especially like his summary of how PowerPoint has been used to communicate military strategy throughout history, including before the penultimate battle in Braveheart. This short clip might come in handy some day if you want to talk with one of your classes about the limitations of PowerPoint. Michael Crowell sent me a hypothetical PowerPoint presentation that might have been used by Abraham Lincoln in dedicating the Gettysburg cemetery. It is a classic. The slide that reviews the key objective and critical success factors is terrific. Click on the speaker notes and you see the real address—“These are some notes on the Gettysburg meeting. I’ll whip them into better shape when I can get on to my computer.” PowerPoint surely is not poetry, but it also is a poor substitute for a well told story. Two other interesting examples came from Robby Poore. He mentions an interesting article by Edward Tufte about how NASA’s use of PowerPoint contributed to poor decisions during the final flight of the space shuttle Columbia. Richard Whisnant’s earlier presentation had referenced Tufte—a Professor Emeritus at Yale University, where he taught courses in statistical evidence, information design, and interface design—who is one of PowerPoint’s most thoughtful critics. According to Tufte, the accident review board “found that the distinctive cognitive style of PowerPoint reinforced the hierarchical filtering and biases of the NASA bureaucracy during the crucial period when the Columbia was damaged but still functioning.” The bulleted slides helped NASA to pitch a superficial and more positive point of view of the risks that would not have withstood scrutiny had it been presented in a rigorous technical report. Here is a short case against PowerPoint made by Edward Tufte in Wired magazine. How about we get proactive? 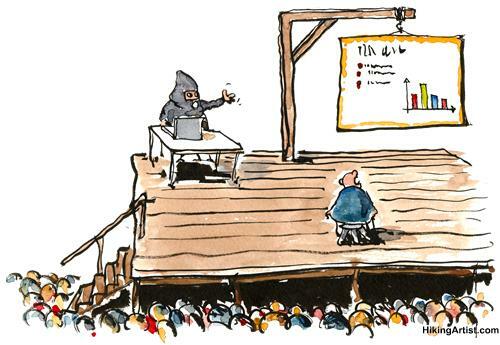 Criticism of Powerpoint is easy because we have all seen way too many presentations where it gets used badly. While I think the structure of the program does cause some of the problems, I think the blame lies much more heavily on how people use it. Rather than gripe about what’s wrong (I liked the examples above), I’d like to suggest for those interested we have some sessions (maybe brown bag lunches) this summer where we get together and share ideas for how to use the tool better or alternative formats for presentations. Reading about the problems is one thing but maybe we could get together and figure out some solutions to raise our standard of practice. I know I’m guilty of some of the failings but I’ve been working on it. I’d be happy to share some of what I’ve been trying to do to make this better and I’d love to see what others are doing. We might also explore some of the books out there on this subject by having different people seek to distill books such as “Beyond Bullet Points”, “slide:ology”, or “Presentation Zen”. Although not as big picture, we could also explore smaller technical parts of Powerpoint (eg. custom slide shows, animation, master slides, etc). If you are interested, respond here or send me an email. I’ll take the responsibility for organizing this if others are interested in exploring how to push ourselves to get better with this tool or alternative presentation tools. I’m game for exploring big ideas or smaller techniques. Excellent idea, Dale. Let’s not play Devil’s Advocate with PowerPoint, which is entertaining but not helpful. Let’s brainstorm about some ways we could use it (or other tools) most effectively. I thought it was pretty cool that David Byrne, an undeniably creative guy, was saying that he found creative ways to use PowerPoint. For any of you who’ve heard me go on about this, you’ll know I’m a big advocate of PowerPoint Karaoke ( http://www.powerpointkaraoke2009.com/ ). The premise? You get a stack of 10 or so PowerPoint slides, and you have 3-5 minutes to present on them. This sounds pretty simple… but the ‘karaoke’ part of the game comes in to play, because they’ll be 10 slides you’ve never seen before, on a topic you may or may not be an expert in. I suppose the thing that I really like about this game (other than the fact that it’s almost always hilarious) is that I think it really gets down to the core of what PowerPoint is supposed to be. It’s not supposed to be twenty slides that you read verbatim for an hour. It’s a tool that helps convey a message. It’s something that you use in conjunction with your own personal skills and experiences to highlight the key points of your talk. With PPK, if you lack the underlying skills that you need — public speaking, a fair degree of quick thinking, and coolness under pressure, you’re going to “crash and burn”, so to speak. But, if you’ve got the skills to effectively present without relying on PowerPoint to be your voice, I think that’s when you can really get all the ‘value-add’ out of it. Mike: Here is another comedic jab at the military power point chart from Bill Maher. Maybe not as funny as Jon Stewart’s treatment, but Bill makes his points. This is during an interview with John Bolton, and the chart discussion starts around the 2:15 mark. I think the biggest issue with Powerpoint is that, in my opinion, it is not very useful without the presentation given with it. I intentionally keep the information on the slide to a minimum, and then I talk in greater detail on the subject of the slide when it is on the screen. I would argue that there is utility in this–it gives the audience something to look at when you talk, it can be an effective way to collect information through Turning Point, and it allows the presenter to use visual aids, videos, &c. Posted presentations are also a way to distribute website links in context. But for me the greatest utility is not for the audience but for me. Powerpoint presentations are essentially outlines of the talk, and I find that in preparing them I better organize my own talk. This article gives tips for avoiding PowerPoint pitfalls and offers some examples of well-done PPT presentations: http://www.slate.com/id/2253050. The problem isn’t PPT itself, it’s how and when it’s used. Poorly designed slides, heavily laden with words and data have given PPT a bad name. This is really user error. But knowing how to use the tool is only part of the equation. The other part is knowing when to use it. Implementing instructional design principles when pulling together a course will help instructors not only create useful slides and supportive materials, it will also help them determine when to use slides/PPT, when to talk/lecture and when to incorporate other activities into the course to strengthen its educational potential.